It is always a pleasure to present a piece of redware in such fine condition. Obviously this Pie Plate was used, but it was not abused. Very fine condition with coggled rim and 3-line yellow slip decoration, it is graphically strong and would be a nice addition to any collection or as a stand alone piece. 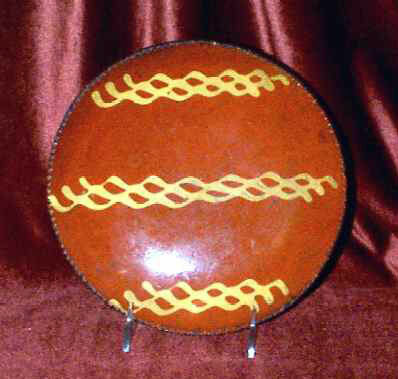 It measures 9" in diameter, the color is bright, and outside of some very minor wear to the glaze on the rim, the plate is in outstanding condition.